In a mixer, whip together the whipping cream, 1 tbsp sugar, and the vanilla. Set aside. In a food processor blend together the frozen raspberries and 1/2 cup sugar. Once the raspberries have been blended, fold them in to the whipping cream. Evenly distribute the dessert between 4-5 dessert cups or fancy glasses. You can make this dessert in the early afternoon of the same day that you are going to eat it. That way it will be ready for dessert when you are! Use any type of fruit that you would like: strawberries, blueberries, mango. 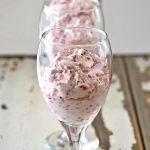 – I like to use frozen fruit for this because it doesn’t get pureed down like fresh fruit does. But either type is delicious and works for this dessert.